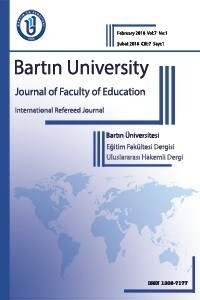 Prof. Dr. Çetin SEMERCİ, Bartın University, Faculty of Education, Department of Educational Sciences, 74100, Bartın, Turkey. Assoc. Prof. Dr. Ramazan YILMAZ, Bartın University, Faculty of Education, Department of Computer and Instructional Technology, 74100, Bartın, Turkey. Bartın University, Faculty of Education, Department of Educational Sciences, 74100, Bartın, Turkey. Bartın University, Faculty of Education, Department of Mathematics and Science Education, 74100, Bartın, Turkey. Bartın University, Faculty of Education, Department of Computer and Instructional Technology, 74100, Bartın, Turkey. Bartın University, Faculty of Education, Department of Turkish and Social Sciences Education, 74100, Bartın, Turkey. Bartın University, Faculty of Education, Department of Foreign Languages, 74100, Bartın, Turkey. Bartın University, Faculty of Education, Department of Fine Arts Education, 74100, Bartın, Turkey. Bartın University, Faculty of Education, Department of Foreign Languages Education, 74100, Bartın, Turkey.